Question: Study the following flow chart on the population growth of the last four decades in millions in Bangladesh and give your personal opinion about it and tell about the problems created due to this and also suggest possible suggestions. 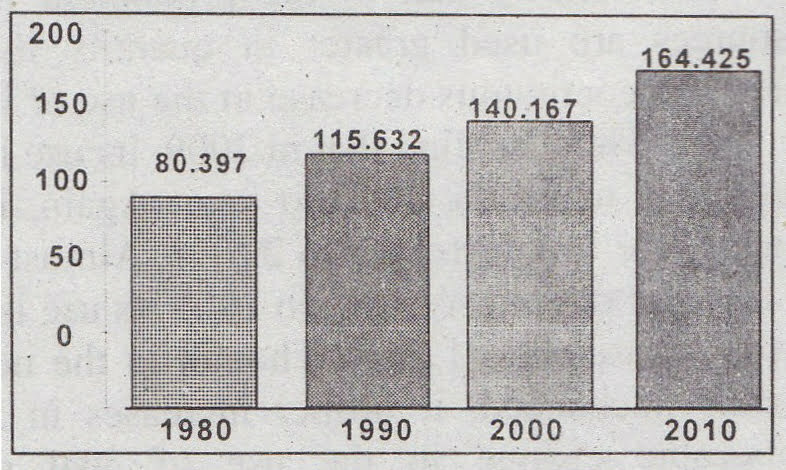 Answer: The chart shows the trend of population growth in Bangladesh decade wise. A general trend in the graph is the growth of population over the years. According to the chart, there were 80.397 million people in 1980. Within a span of 10 years, the number increases to 115.632 million. Again in the next decade, the number increases to 140.167 million. There has been a further increase in population in 2010. From the graph, it is clear that the population grows very rapidly over time, and within a span of 40 years, the population becomes double. This is really an alarming growth of population in the context of Bangladesh which is a very small country. Due to this alarming growth of population, Bangladesh is facing many problems such as housing problems, food problems, education problems and so on. Therefore, the population needs to be controlled anyhow, otherwise, the country must face more dangerous situations. I think Govt. can take more effective measures to control the growth of population. Like China. Govt. can make some law to adopt the one-child policy.